1808: Agha Hovsep's arrival at the Isle of Java and started his empire. 1810: Java was taken over by the English from the Dutch. 1811: Agha Hovsep supported the English against the Dutch. The location of the plantations/farmlands of Agha Hovsep Hovhanes Amirkhan on the isle of Java. The farmlands were sold after his death by his children, as they had their own farmlands. The lands were used to grow Coffee, Indigo and Rice, Coconur, Pepper, Tea. The nett revenues per year amounted > 500.000 Neth. Indies Guilders. Each land as mentioned above were provided with houses, sheds, warehouses, houses for the laborors and equipment needed for the growth of the crops. It was in the year 1808 and a schooner called De Tyger was sailing from Calcutta boundwards to Semarang, located on the north coast of the isle of Java. 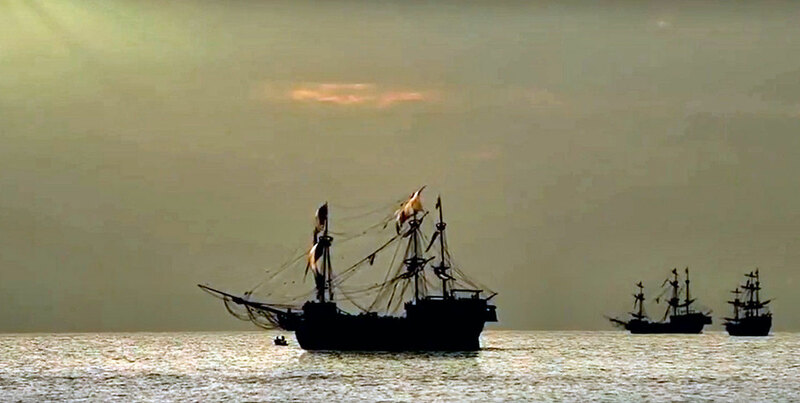 On board the ship was a 30-year old handsome man called Hovsep Hovhanes Amirkhan and he brought along some personal belongings, some letters destined for Armenian Traders at Java originating from the merchants of Calcutta and his merchandise. In his personal belongings were some credentials too, written and guaranteed by the Bank of Calcutta, for he was a reliable valued client of this bank. Agha Hovsep was born in the year 1778 in Fereidan, a region of Isfahan and from his birth on, fed with the idea of a free Artsakh, the land of his forefathers and it became and remained his goal for the rest of his life. He was sent to the Armenian School at Calcutta at age of 18, was being taught the Armenian culture, English language and other classes/subjects. And soon Agha Hovsep made his plans for life: Raise money as much as possible and use this money to create a free Artsakh. Nothing should stay in his way or should withstand him, for being a Khojakh was written in his blood. Some old school experienced Khojakhs had taught him well the basics of raising capital. His carreer should be in a place which was "blank" and which was not occupied by competitors. The place should be free of watchfull eyes. The place should be easy obtainable from sea as well from land. The place should be maidenly and not yet filled with farmlands. The choice was easily made: And the town of Semarang at the isle of Java it would be. For India was too "crowded" and Ceylon same ditto. Batavia at the isle of Java was the centre of the Armenian Merchants and also the location where the Administration of the Colonial forces were located and one thing explicitly Agha Hovsep could not use: "Watching eyes". Agha Hovsep hit the mark right in the middle with his choice and within a couple of years only, his raising of capital grew enormously day by day. He bought farmland and more farmland and showed his aversion in all ways of the Dutch rulers' behaviour towards the local residents; Agha Hovsep treated them well and had them generously rewarded for their farmwork and other labour; thusly in this way making them loyal and trustworthy and enabling him to focus on his other business. Besides farming, Agha Hovsep negotiated everything valuable: pearls, diamonds, cotton- and silk clothing, ships, sugar mill-equipment, warehouses and even houses, tobacco, raisins, butter, liqors, wood, marble and more and all in huge quantities, since he was a Khojakh and not used to deal in peanuts. In 1810 the English took over the isle of Java from the Dutch, since Holland was occupied by Napoleon of France and the English therefore had to protect South East Asia from the French aggression and plans of taking over the Dutch colonies. The English troops controlling Java, needed money, food and shelter and Agha Hovsep was the one who provided the English all what they needed. As a token of reward, the Lt. Governor of Java Sir Thomas Stamford Raffles rewarded him in 1811 with a mountaneous piece of land called "Johannesberg" nearby the land of Simongan Semarang, also named Gunung Mlaja. (* B.T.v.P. archives). This piece of land was transformed into a farmland for tea growing and on top of the hill a graveyard was erected divided into one part for the European Christians and the top of the hill became the graveyard for Agha Hovsep himself, his family and other Armenians. The top of the hill was overlooking the land till far away over the Java Sea and many times Agha Hovsep took place on this top and enjoyed the view giving his mind peace and serenity. 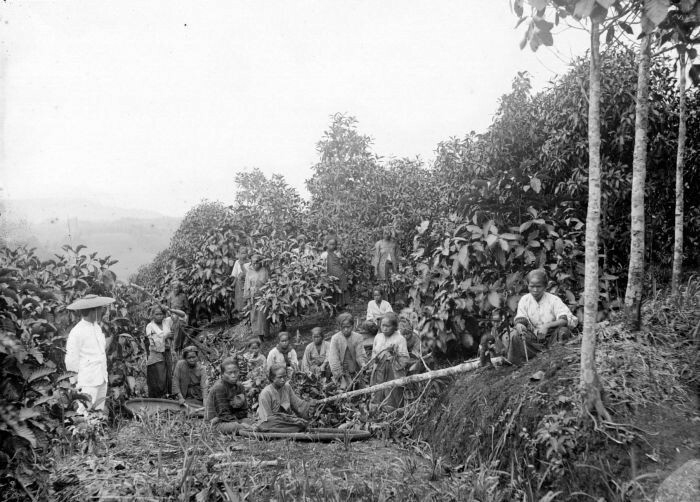 Right: A scene of coffee farming.